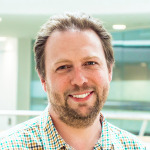 Andrew then worked in a variety of roles at Swinburne University in software development, systems administration, high performance computing and scientific visualisation. More recently Andrew worked closely with Swinburne's Pulsar Astronomy group developing hardware and software instrumentation systems for use at the Parkes Radio Telescope. This work had a strong focus on data acquisition, real-time processing, interference excision and data archival. Andrew has substantive experience with C/C++ programming, GPU/CUDA, PHP/Webserver, Infiniband/10GbE, RAID, High Performance Computing and FPGA technologies.